I made this tea party cake for my daughter’s 3rd birthday. 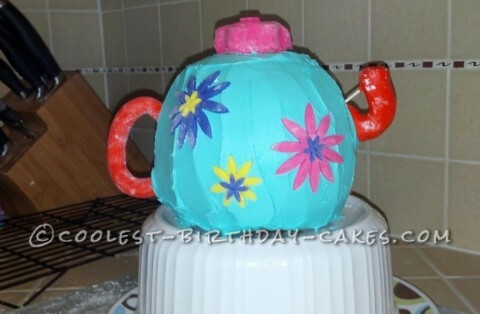 Her party was Tea Party everything, even a tea pot pinata. For the cake, I made a dense, butter poundcake (from scratch and it was delicious) and baked them in two large oven safe Pyrex bowls. I made a third small cake in a smaller oven safe bowl for the “lid”. I stacked the two larger bowls on top of each other to make the teapot. The icing was a simple vanilla butter cream with fondant accents. I rolled the handle and the spout by hand. For the lid, I trimmed it from it’s original shape using a flower shaped cookie cutter and covered it with the pink fondant. When I served it at the party, the biggest reaction was people’s surprise that I had used Pyrex bowls. Of course, the cake itself was tasty, but my favorite part about making it was how easily it came together. There weren’t a ton of steps to the decorating process (even though I did stay up until midnight the night before the party finishing it). To accompany the Teapot cake, I also made chocolate cupcakes served in clay pots. I topped those with green tinted frosting and sprinkles.